The protagonist is Mordecai Goldman—a man born of chaos and steeped in violence. The story spans the 1920’s to the present day. The reader is engaged in Mordecai’s life from the moment his little brother, Simmy, comes home with a knife stuck in his shoulder. The reader follows Mordecai’s turbulent years in an all-Christian high school in his native Poland, to his Polish military service, through the outbreak of the Second World War where he becomes a tank commander in the Soviet army, to the moment where he drives his tank up to the steps of the Reichstag. After the War, he meets his future wife and emigrates to Canada. The story is one based on loss as Mordecai says goodbye to everyone he loves, outliving them all; his parents and sister, his first love, Maria; his passionate love for Olga—a Soviet army surgeon and finally, his wife and companion, Esther. Mordecai begins his life in violence and ends it the same way. A single crystallizing incident takes place during the War that previews the present day and an explosion when Mordecai is an elderly man. He chooses how to end his life in spectacular fashion. This story is based on true events and Mordecai Goldman was a ‘real person.’ This is his story; tough, passionate, and stubborn to the end. 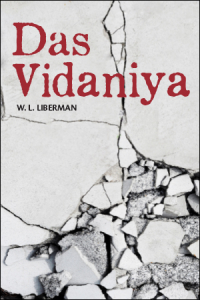 Das Vidanyia is now being distributed by Creativia Publishers. If you are interested, you can purchase it from Amazon.